Ideas, drills and an overall plan for developing good communication habits on the defensive end of the court. *This is Part 2 of a 3-part series. Check out Part 1 on Why Team Communication is Important, and Part 3 on Offensive Communication. When discussing communication in basketball, most coaches immediately focus on the defensive side of the ball. The reason for this is there are great benefits from communication on that end of the floor. Through scouting and game planning, the defense may have a good idea of what the offense is going to do, but throughout the game it will have to make instant adjustments based on player and ball movement that it’s unable to predetermine. Good team communication takes the defense from reacting to the offense, to anticipating what comes next. By its nature, reacting has a delay. Anticipating minimizes this delay and allows the defense to get a head start at getting a stop. Who has the ball? – Identifies who is guarding the ball and allows the rest of the defense to get set up. When this is unclear, no one may stop the ball or more than one player may try to cover the ball, resulting in other offensive players being open. Call Your Match-up – Each offensive player should be accounted for. Good communication makes sure that everyone is covered. Identifying Positioning – Shares position with teammates, giving them confidence that they have help. Calling “Shot” – This signals the defense to box out whether defenders saw the shot go up or not. Scramble Situations -These can happen in transition defense or in the half court when there are defensive breakdowns. The goal is to communicate to un-scramble as quickly as possible and get matched up. An open man is more dangerous than the correct match-up, so the defense needs to make sure everyone is guarded. Defending Actions – How will you defend ball screens, dribble handoffs, pindown screens, flex screens, etc.? Having a communication system in place and an understanding of how your team is defending these actions minimizes confusion and prevents defensive breakdowns. Identify specifically what you want your team to say for each of the communication responsibilities. Have a common language that is quick and efficient that you use throughout your program so everyone can understand each other. Have players repeat the call three times to make sure they are heard when stopping the ball (“ball, ball, ball”), identifying positioning (“help, help, help”) and defending actions (“rip, rip, rip”). Include a communication component that is clearly identified for each defensive drill you use. Give the defense 1 or 2 things at a time that they are responsible to say. You can also give players that are not actively in the drill something to say to help enhance the culture of communication. Once taught and practiced a few times, if the defense fails to communicate there must be an immediate consequence. Use defensive perfection drills where the defense has to get a stop and communicate perfectly in order to score. Focus on communication in game situations. In scrimmages, you can take a point away for not performing the communication focus or sub out the offending player. This competitive defensive drill focuses on closeouts, sprinting to help and stunting at the ball. The communication focus is on calling the ball and identifying positioning. Require the defenders to say “I Got Ball” on the closeouts and “Help” when they are in help. The defense must defend and communicate four passes perfectly then they can play live 2 on 2. On the first two passes the defenders sprint to help/closeout. On the third and fourth pass the defenders stunt at the ball as it is driven at them, then sprint to closeout/help. Use defense scoring in this drill. If the defense gets a stop they get a point and they stay on defense against the next team. If the defense doesn’t communicate, sprint to help, close out correctly or they get scored on they immediately lose and go to the end of the line and the offensive team goes to defense. Use this drill to work on defending scramble situations when the defense is temporarily outnumbered. Once the ball is entered the drill is live and the offense tries to score 4 on 3. The 4th defender can enter play after 7 seconds OR after a shot is taken. The three initial defenders will not have a match-up, but whoever is closest to the ball must pick it up as they buy time for the 4th defender to get on the floor. To add a communication component to the drill require defenders to say “I Got Ball” when they closeout on the ball so they don’t accidentally get two defenders on the ball. If a defender is in a situation where they are guarding two people, have them say ” I Got Two.” The 4th player enters the floor going furthest from the ball. They must communicate who they are guarding and tell their teammates where to match-up so they can get out of the scramble situation. This continuous 3 on 3 drill teaches the defense to defend the flex action using different roles with different communication responsibilities. The drill will will be repeated three times so each defensive player has an opportunity to practice each part. 3 calls the screen and provides help. 2 goes over the cross screen on the baseline and communicates when matched back up. 1 communicates the down screen and opens up to allow 3 to get through the screen. 3 informs 1 when they are through the screen and matched up. Defensive possessions can be difficult to control as a coach. Coaches can’t make every decision for their players on the floor. This is why teaching good habits and concepts empowers the team to make good decisions on defense. 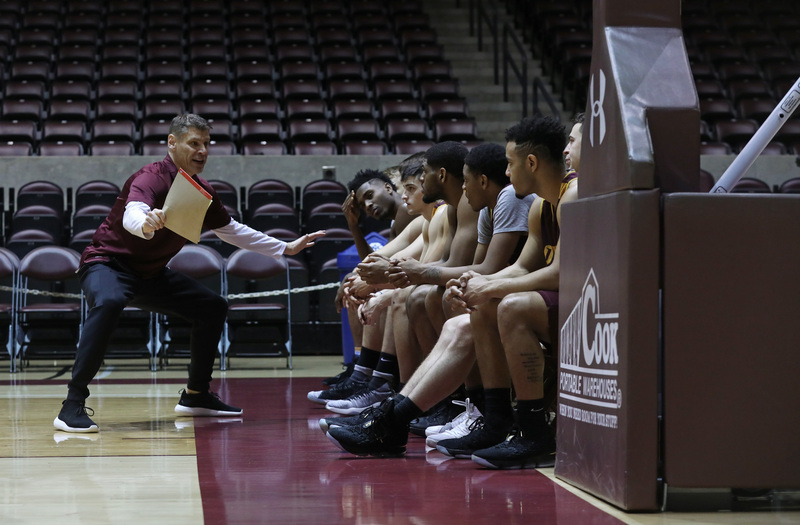 When players are better decision makers, they have the ability to adjust to multiple situations as they happen on the floor, thus becoming better overall players. In the following post we will look at some drills and concepts you can use to build a communication system for your team on the offensive side of the floor. Matt Wheeler has spent the last 11 years coaching in the Orlando, FL area. For the last 2 seasons he has helped to build a new program at Windermere High School, where they were able to reach the state final four in the school's second year of existence. Before that Coach Wheeler served 6 seasons at Olympia High School where he spent time as assistant boys varsity coach, head girls varsity coach, and head boys varsity coach. During his tenure there he saw 5 players reach the Division 1 level and 16 players receive basketball scholarships. Previously, Coach Wheeler was an assistant coach at Montverde Academy under then head coach Kevin Sutton. While at Montverde Academy he assisted with player development, conditioning programs and created team playbooks & scouting reports. Coach Wheeler's experience also includes winning the 2008 3A Girls Basketball Florida State Championship as an assistant at Bishop Moore Catholic High School. Coach Wheeler was born and raised in Portland, Oregon. He got his coaching start at Cascade College where he was the student assistant for the women’s basketball program while also participating on the men’s JV basketball team. Coach Wheeler resides in Orlando, Florida with his wife Kiana.